Unit constructed of 14/304 stainless steel all-welded construction. Drain pan has built-in pitch towards drain, accommodates up to a 4"-diameter pipe, and comes standard with a stainless steel removable perforated basket. 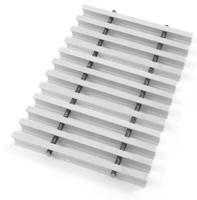 Fiberglass grating to be 1" high polyester material with a non-slip grit top surface. Tapered I" beam construction for ease of cleaning and drainage. FT-12120-FGG 12" x 120" floor trough with gray fiberglass grating. FT-1218-FGG 12" x 18" floor trough with gray fiberglass grating. FT-1224-FGG 12" x 24" floor trough with gray fiberglass grating. FT-1230-FGG 12" x 30" floor trough with gray fiberglass grating. FT-1236-FGG 12" x 36" floor trough with gray fiberglass grating. FT-1248-FGG 12" x 48" floor trough with gray fiberglass grating. FT-1260-FGG 12" x 60" floor trough with gray fiberglass grating. FT-1272-FGG 12" x 72" floor trough with gray fiberglass grating. FT-1284-FGG 12" x 84" floor trough with gray fiberglass grating. FT-1296-FGG 12" x 96" floor trough with gray fiberglass grating. FT-15120-FGG 15" x 120" floor trough with gray fiberglass grating. FT-1524-FGG 15" x 24" floor trough with gray fiberglass grating. FT-1530-FGG 15" x 30" floor trough with gray fiberglass grating. FT-1536-FGG 15" x 36" floor trough with gray fiberglass grating. FT-1548-FGG 15" x 48" floor trough with gray fiberglass grating. FT-1560-FGG 15" x 60" floor trough with gray fiberglass grating. FT-1572-FGG 15" x 72" floor trough with gray fiberglass grating. FT-1584-FGG 15" x 84" floor trough with gray fiberglass grating. FT-1596-FGG 15" x 96" floor trough with gray fiberglass grating. FT-18120-FGG 18" x 120" floor trough with gray fiberglass grating. FT-1824-FGG 18" x 24" floor trough with gray fiberglass grating. FT-1830-FGG 18" x 30" floor trough with gray fiberglass grating. FT-1836-FGG 18" x 36" floor trough with gray fiberglass grating. FT-1848-FGG 18" x 48" floor trough with gray fiberglass grating. FT-1860-FGG 18" x 60" floor trough with gray fiberglass grating. FT-1872-FGG 18" x 72" floor trough with gray fiberglass grating. FT-1884-FGG 18" x 84" floor trough with gray fiberglass grating. FT-1896-FGG 18" x 96" floor trough with gray fiberglass grating. FT-24120-FGG 24" x 120" floor trough with gray fiberglass grating. FT-2424-FGG 24" x 24" floor trough with gray fiberglass grating. FT-2430-FGG 24" x 30" floor trough with gray fiberglass grating. FT-2436-FGG 24" x 36" floor trough with gray fiberglass grating. FT-2448-FGG 24" x 48" floor trough with gray fiberglass grating. FT-2460-FGG 24" x 60" floor trough with gray fiberglass grating. FT-2472-FGG 24" x 72" floor trough with gray fiberglass grating. FT-2484-FGG 24" x 84" floor trough with gray fiberglass grating. FT-2496-FGG 24" x 96" floor trough with gray fiberglass grating.